Formal Assessment– This is taken by large groups of students from variety of locations. Here teachers no control over the assessment. 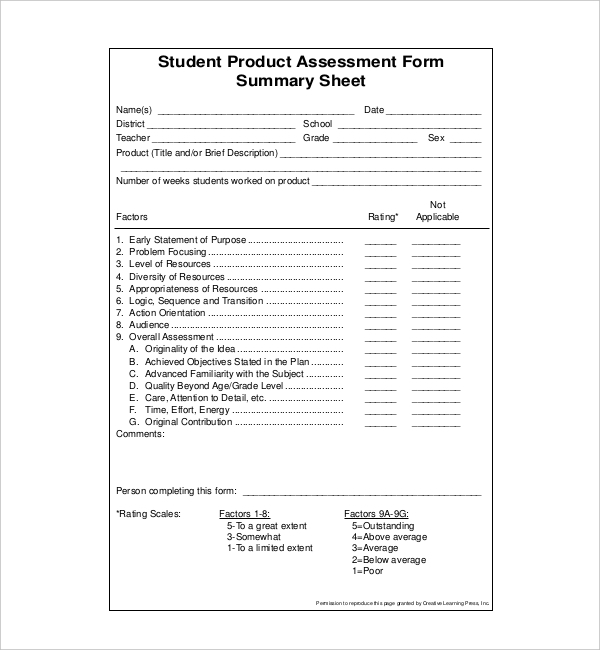 Informal Assessment: This form is used in classroom designed by teachers for specific group of students. It can be adjusted and customized accordingly. 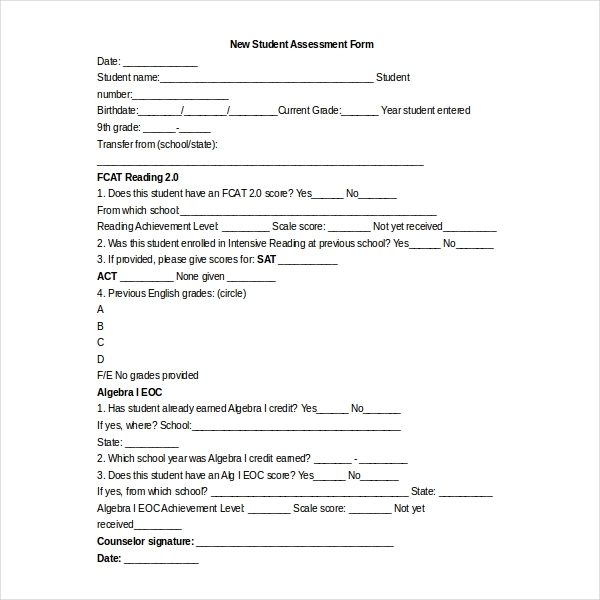 This assessment form is designed for new students seeking admission in college or for higher education. Once the student applies for the admission, the next step is to undergo the assessment test. This includes reading and math. If the student successfully passes out from this test, then all other tests are exempted. This is also called as Orientation form needed to be undergone while seeking admission. 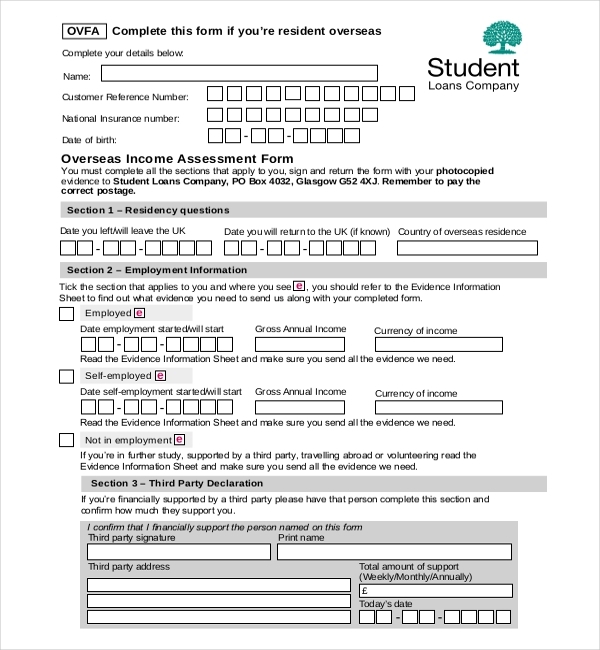 If you are seeking student loan for the higher education and belong to other country then, you need to fill the overseas student assessment form. You need to provide all the information regarding the finance and other employment details. The form also consists of UK bank and residential account details. Every university in UK ask foreign students to fill this form while seeking admission for the higher students. Secondly, evaluating to relate the worth of the product according to the student’s age and grade. Thirdly, considering the growth of student in terms of improvement. It helps the student to guide towards excellence and is shared among student before the start of product. This confidential assessment form is prepared by current school counsellor, Match and English teacher. This form gives a clear picture about the teacher on how students are trained by them. 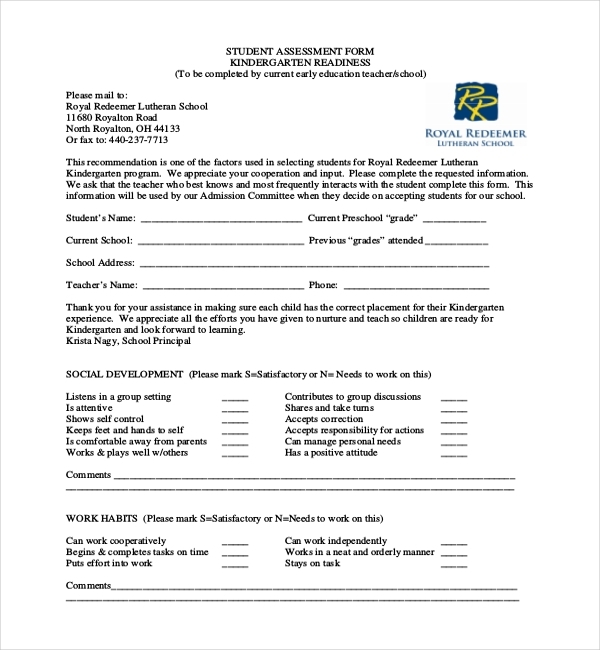 The form is for students applied to grades 9 through 12. It consists of student habit, self-discipline, relationship with peer s and teachers and many other things. It described complete information of student’s about the character, values and special interests. If you are keen on taking up the music education, then you need to fill the evaluation form for further development. The form involves demonstration of music understanding, understanding of conducting skills, understanding of technical knowledge of instruments and other areas. You also need provide information on planning and implementation of musical knowledge, positive learning environment, diversity, technology and overall progress in the musical knowledge. 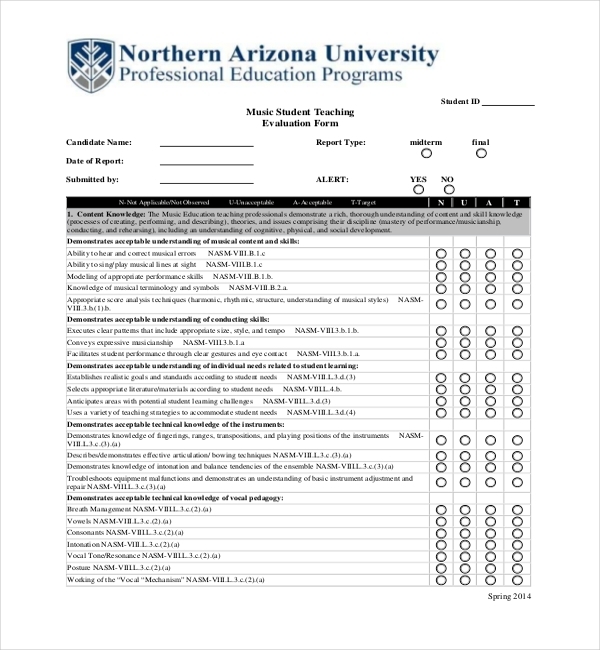 This assessment form is prepared by employer to their student employee to assess their performance throughout the internship. Students are being rated between 1-5 for attendance, punctuality, Quality of work and other areas of concern. It also includes the job task and number of work hours completed during the internship. 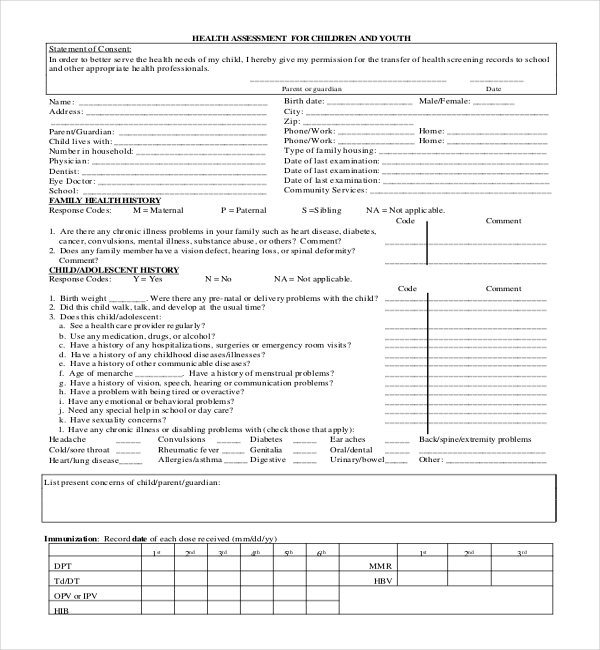 Every employer need to offer this assessment form to high school student helping them for future work career. 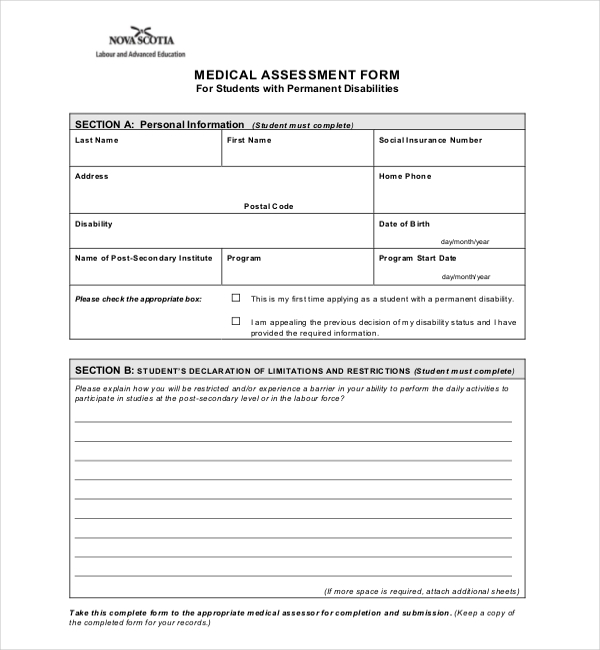 This assessment form is completely for permanent disability students. The form is to assess the condition of the student and program undertaken. The form also consists of area to be filled by medical assessor to provide information about the nature of permanent disability of the student. The form gives clear picture about student’s medical condition. On the basis of the mentioned medical condition, student is being provided the admission for the desired course. 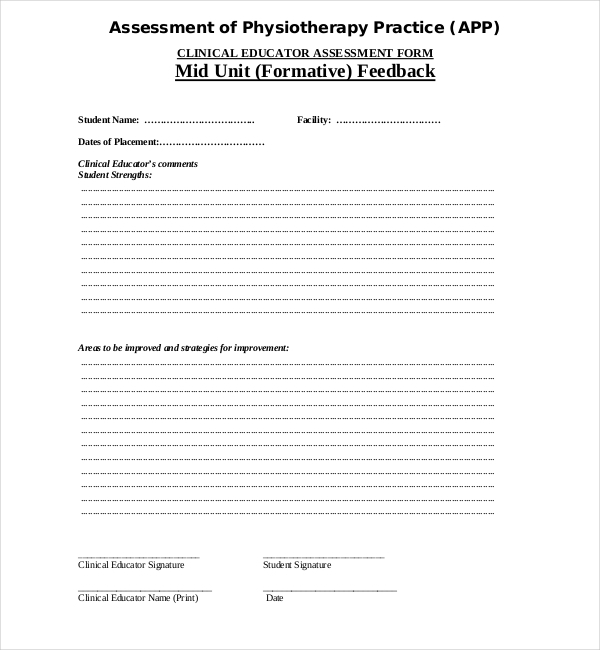 If you are undergoing any physiotherapy assistance and seeking admission for higher students, then filling up physiotherapy student assessment form is essential. 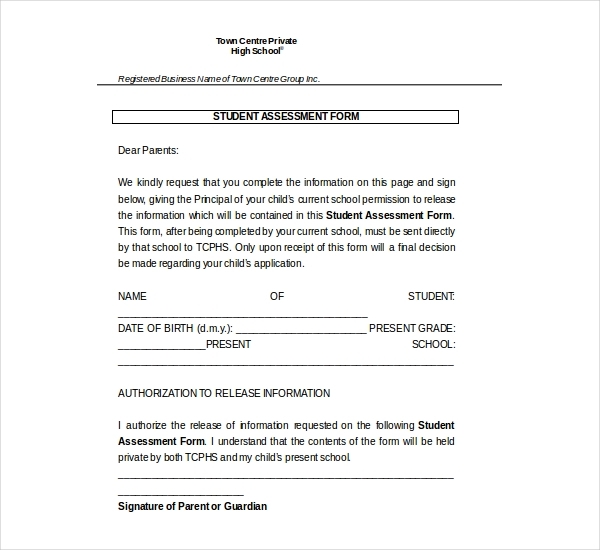 The form need to be filled with all the medical information of the student. Moreover, it also consists of areas that need to be improved and strategies for the same. 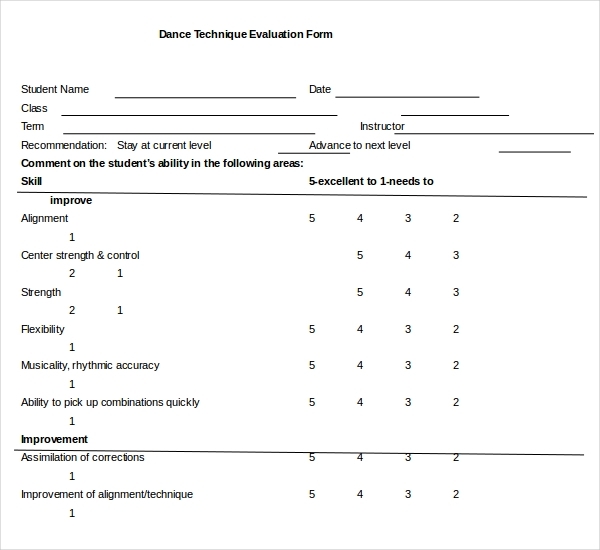 Also known as Mid Unit formative feedback, the form also consists of rating about different health issues. This includes professional behaviour, communication, planning and risk management. It consists of two different parts- Mid Unit Formative Feedback and End of Unit Summative feedback. This assessment form is to be filled by parents of the respective students to receive health assessment screening which includes: hearing, vision, dental, lead, health history and complete physical examination. In other words, the parents are giving due permission for the transfer of health screening records to school and health professional. The form also includes family health assistance, child health history to get complete information. According to the screening report, students and parents will be evaluated accordingly.